Assembling the tools you need to manage more effectively. Managing employees in today’s workplace has never been harder. Stepping into a management position requires you to have the business tools to not only manage goals but also manage deadlines, projects & priorities, coach teams, coach for performance, deal with employee attitudes, run effective meetings and cope with middle management challenges. This seven week certificate program will give you the crucial tools to help you shift from being an individual contributor to a manager who gets results. It can help managers and/or those on a management career path develop and enhance their management skills. Manager’s Toolbox is an interactive training program designed to provide managers with skills to increase their individual success and maximize the impact they have on their employees and organization. If you have some supervisory experience, and feel frustrated with your current teams lack of accomplishment, the Toolbox program can guide you in polishing the skills that take you to the next level. Meetings, teamwork, attitude and that “stuck in the middle” feeling become the focus of this program. The Manager’s Toolbox is the perfect next step for those participants that have completed the Supervisor Certificate program within the last year. The topics covered lend themselves to additional learning that stretches your leadership skills. Manager’s Toolbox instructors bring years of management training and experience working with leaders from a variety of industries. In these training sessions, your instructor will instill a new found confidence in your management skills, zero in on real life challenges you are experiencing and provide tools you need to resolve them effectively, create a safe environment for honest interchange with others in the group, and challenge you to apply the learned techniques in your environment. Nobody said managing would be easy, and whether you’ve been managing for years or you’re looking forward to that promotion into management, you’ll become your best with tried-and-true techniques, strategies and “how-to’s for management success. Leading from the middle requires the ability to interpret your organization’s vision and goals. 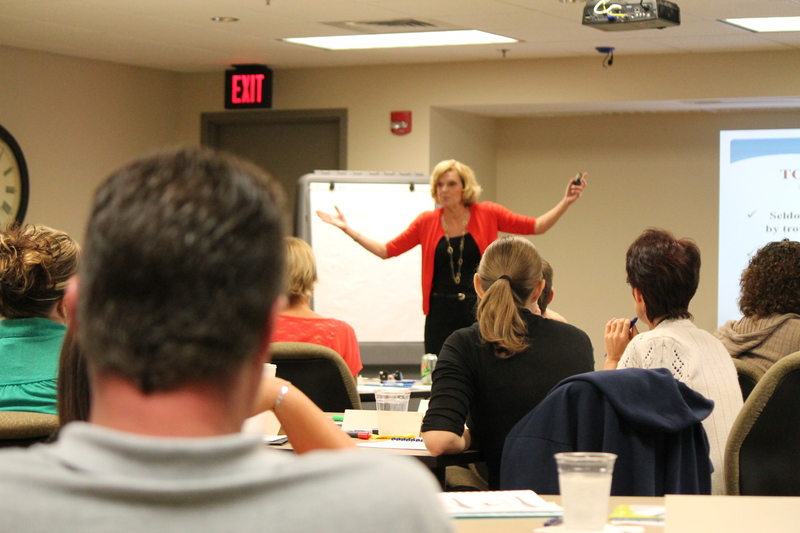 Effective managers learn to bridge employee needs with organizational goals. They understand why it is necessary for both the organization and its customers and employees to receive mutual benefits. Managers in the middle have the unique challenge of bridging team needs with upper management requirements. Your employees will automatically be drawn to a manager with a positive, “can-do” attitude. As a manager, you choose how you react to situations. You choose how people will affect your mood. And you choose how you treat and react to your employees and customers. Attitude changes how you respond to your day to day challenges. In today’s workplace the emphasis is on execution. Among other traits, solid execution depends on working on the right things, in the right order, with the appropriate investment of time, energy and resources. This session reminds and exposes you, the manager, to the basic tools of successful project execution. While meetings are great tools for discussing issues, brainstorming and building team cohesiveness, they can also be unproductive and meaningless. This session will cover key strategies for leading a meeting that is productive, action-oriented and helps achieve your goals. After this session you will have the tools you need to conduct and participate in efficient, effective meetings. Fostering teamwork with Don Hackett, Ph.D. The most obvious advantage of fostering teamwork in the workplace is the increased likelihood of a project’s success. Since teamwork combines the strengths of all members of the team, there will be better ideas tossed around and considered as the result of brainstorming. The most important advantage is the strengths of everyone are amplified and the weaknesses minimized, thereby leading to success. Identifying the toxic behavior of a team member is easy. Understanding how to tackle that toxic behaviors and keep the team on course is not so easy. With hands on exercises that will give you the path to tackle performance issues and move the team into a positive direction, this session will strengthen your “Coaching” abilities. Strength based management with Gerald Graham, Ph.D.
A manager needs to know his strengths in order to call on the right strength at the right time. Focus on your strengths and create opportunities for your employees to develop and apply their strengths. In this session you will have the opportunity to learn your top five strengths and receive a resource book identifying tools to being a more effective manager. What can you gain from attending Manager's Toolbox besides skills and confidence? Certificates will be awarded to participants who attend at least six out of the seven sessions. The biggest advantage you gain is that after completing Manager’s Toolbox, you can fast track to a Leadership Certificate. All you have to do is enroll in five (5) additional CMD public seminars over the next 12 months, and you will earn a Leadership Certificate. That’s a difference of taking 5 days of training vs. 9 days of training. If you have missed a session of Manager’s Toolbox last spring, and you want to make it up in the spring of 2019, you can do so for FREE. If you did not receive your Manager’s Toolbox Certificate because of a missed session, and you come back to us to make that session up, you will receive your certificate when you complete the 6th session of the seven.